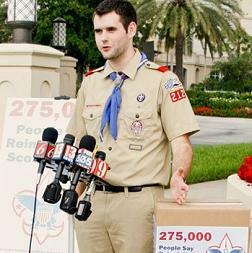 Eagle Scout Zach Wahls loves two things, homosexuality and the Boy Scouts. Unfortunately his passions are forever at odds because the Scouts have always prohibited gays from joining their group. Last week Zach presented a petition with 275,000 signatures to the organization demanding they reinstate Jennifer Tyrrell, a lesbian den mother who was kicked out for being gay. The petition also seeks to overturn the ban against gays joining the Scouts. Senior Boy Scouts leaders sat down and met with Mr. Wahls after receiving the petition but soon afterward released a statement saying they had no plans to change their policy. Zach wasn’t deterred and said he and other scouts plan to sue if the policy is not changed. Personally, I’ve always thought it was odd that a group that encourages boys to wear short-shorts and neckerchiefs prohibits homosexuals. It just seems like such a gay little outfit. Then again, what do I know? I’ve worn an identical blue shirt every day for nine straight years. If Zach is so adamant that gays be allowed to join scouting, he should just go ahead and form a competing organization. He could call it the Toy-Boy Scouts, and it could be a place where gay men would be encouraged to mentor young boys. I imagine the camping trips would be a little uncomfortable, and the merit badge for wood working might take on a new meaning, but no one ever said tolerance would be easy.